Inaugural Session – Mr. Ramesh Datla, MD, ELICO & Chairman - CII National Committee of IP Owners delivering inaugural address; (L-R) Mr. Tabrez Ahmad, Chairman, Intellectual Property Committee, Manufacturer’s Association for Information Technology (MAIT); Dr. A S Rao, President, Indian Innovators Association; Dr. S. Chakravarthy, IAS, (Retd) & Advisor, APTDC. Andhra Pradesh Technology Development & Promotion Centre (APTDC) & Confederation of Indian Industries (CII) in association with Department of Electronics & IT industry, Govt. 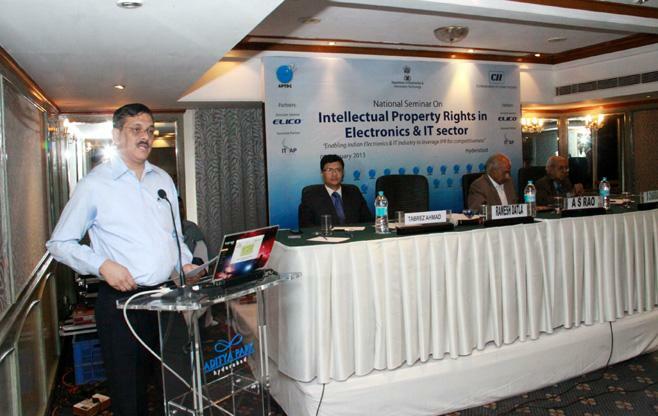 of India organized a National Seminar on Intellectual Property Rights in Electronics & IT on 08 February, 2013 at Hotel Aditya Park in Hyderabad with an objective to enable Indian IT and Electronics to leverage IPR for competitiveness. Mr. Ramesh Datla, MD, ELICO & Chairman-CII National Committee of IP Owners in his welcome remarks laid out the agenda for the one day seminar and also the layout for the inaugural session. He Spoke on innovations in MSME’s by giving a case study about his firm ELICO Ltd. He emphasized that how IP can be used as a business tool among MSMEs for collaborative partnership with other organizations and come out in win-win situation. Mr. Tabrez Ahmad, Chairman, Intellectual Property Committee, Manufacturer’s Association for Information Technology (MAIT) in his special address spoke on the immense need for bringing in an innovation culture by Electronics Sector. He said although IT sector has started pacing up with the current international IP filing of Intellectual Property Rights but still, there is a huge gap in IP generation & protection among indian electronics sector to leverage IPR. It is estimated that an approximate 400 Billion USD of Electronic goods will be consumed by 2020 and India can on generate goods worth of 100 Billion Dollars with the current capacity. Hence there is a requirement to bridge this gap and make it lesser in the coming years. Dr. S. Chakravarthy, IAS (Retd) & Advisor, APTDC, in his special address spoke on the need of an hour is to have a balance between creation of Intellectual property as a monopolistic rights and balancing it with healthy competitiveness in the market. He also emphasized that organizations should look forward towards having a positive competitive practices that play a important and ethical role in IP asset generation. Dr. A.S. Rao, President, Indian Innovators Association in his inaugural address stressed on the translation of IP rights into economically useful products and have a market for IPR in India. He also spoke on the need of the hour for creation and value generation from IP assets. Previously, as there was a boom in IT industry, but it was specific to creation of BPOs. Further, he pointed that Dept. of E & IT was established only to serve the purpose of research & development in the field of electronics & information technology. The seminar was well received by industries, academia and R&D institutions from Hyderabad with a positive feedback.